When it’s time to outsource, selecting the right outsourcing advisor may be the single most important decision you make—one that sets up your future relationship with an IT services provider for success or failure. Given that IT outsourcing transactions are complex and vendors are savvy at setting them up to their advantage, solid sourcing advice from a third party can help to level the inherently uneven playing field, particularly for less experienced IT services buyers. Under the theme of “Go Digital – Go Cloud” Huawei’s flagship event in Europe emphasized the need to create and shape an open, innovative ICT ecosystem to empower the digital transformation of European businesses. A large, well-known consultancy may be a good option, but don’t make the decision based on name recognition alone. Now more than ever, there are great lower cost options available, thanks in large part to experienced sourcing advisors who were laid off during the economic downturn and who are now in business for themselvesand, as such, available at a large discount to you. 4. Check—and double-check—those references. You’ll want to talk directly and discreetly with multiple clients of your prospective sourcing advisor who are at least a year into their negotiated outsourcing deals. They’ll be in the best position to tell you whether the advisor’s guidance was worthwhile. The best references, as always, will come from people you know and trust. After the 1938 radio drama War of the Worlds proclaimed “the Martians are Coming,” reports alleged that people ran panicked into the streets. Today, something not too dissimilar is happening with the adoption of robotic process automation – software robots that execute processes in the same way a person does. But this is no hoax. In fact, research from ISG Insights finds that more than two-thirds of business operations leaders plan to deploy software bots by 2020. And the potential for impact on employees is huge. Yet the prospect of automation doesn’t need to be met with panic. The fact is, when properly explained and launched with employee involvement, automation can greatly benefit both employees and the companies they work for. Let’s face it: people are terrified that robots will take over their jobs – and take over the world. How could employees not be suspicious of robots? Help employees understand what RPA is and what it is not. RPA software is configured to eliminate mundane tasks associated with many business processes – the tasks most employees would gladly relinquish. Few people relish the “swivel chair” rekeying of information between and among applications or extracting data from one system to validate it against another. Employees should view RPA “bots” as teammates, willing and able to perform repetitive tasks without complaint and with unmatched speed and accuracy. Business leaders can create enthusiasm and support for RPA by engaging employees in developing the RPA strategy and including them in evaluating opportunities for automation. Employees know precisely where bottlenecks or redundancies occur. Their imagination and vision can be a means to rekindling the creative capacities that may have been stifled while performing recurring processes. Adhere to the adage that involvement leads to commitment. Involving employees at a higher level creates excitement around what is possible and helps them understand where and how they might fit into a changing organization. Unquestionably, the quest for cost reduction is a driver behind automation adoption. And with good reason. The ROI on a typical investment is more than 500 percent. Yet, many don’t understand from the outset the impact automation can have on speed-to-market and revenue cycle improvements and how it can lead to new opportunities for employees to perform higher-value work. Train and reskill employees to become process assessment experts and help them acquire skills related to managing virtual workforces. Case in point: a premier insurance company recently deployed RPA and was immediately able to bind more policies faster and more accurately simply because it could process broker requests for quotes by eliminating tedious work that underwriters had been performing. Ultimately, management retrained and redeployed workers to accommodate the increased demand for policy binding. Including employees in defining the impact of RPA on their jobs and the related upskilling opportunities is critical. It should be non-negotiable. The possibility that RPA will eliminate human workers is not a definitive and inevitable outcome. Give employees the opportunity to self-identify the roles within a process that are likely to be eliminated. Typically, RPA is deployed as part of a larger business process made up of a series of mundane or repetitive tasks that do not fall to individual employees. When employees and their managers begin to understand the operational complexities of RPA, they can work together to identify opportunities for creating new jobs that require new skills. While RPA may start in a specific business unit, its impact and operating results will spread rapidly once it is proven. Formalize a communication strategy and structure for discussing RPA and be prepared to take the message company-wide. Stay in front of the message. Failure to do so will result in employees coming to their own conclusions and creating their own networks to hypothesize the impact of robotics. Cutting costs will always be essential for competing in the global economy – and robotics are here to stay. But along with the opportunity to automate and streamline processes comes the responsibility to prepare employees. Who better than existing employees to help lead the charge into RPA? I’m in the privileged position of working on both sides of the fence. I’m Professor of Computer Science at the University of San Francisco as well as Chief Scientist at SnapLogic, a provider of application and data integration software. I have worked on AI in both of these roles, and throughout my 20 year career I’ve come to the realisation that, when it comes to driving innovation, these two distinct spheres need to work together. AI promises to be the most important technology of the future, and if the lofty ambitions and out-of-the-box thinking of academia can find synergy with the can-do attitude, urgency and resources of industry, we’ll see an explosion in its applications. In fact, I believe that AI and ML technology won’t just be a nice feature but will be a requirement for all applications go forward. This collaboration between industry and academia has been growing for some time and, like most things in technology, it all boils down to the data. For the first 10 to 15 years of my career I was on the traditional academic track, and whenever we were undertaking research or publishing papers, there was always one consistent stumbling block – we lacked real world data. Of course, the large search and social companies didn’t curate all of this user and behavioural data for the distinct purpose of fuelling AI development, but they saw the potential that it held. The tipping point came when the likes of Twitter first invited academics to analyse this data. Suddenly and unexpectedly, a treasure trove of real world data was made available to academics. All that theoretical machinery that we had been developing in academia could be realised as real recommendations and meaningful predictive applications. Ph.D.s in academia started going into industry and working with real data, fuelling further theoretical developments and so on and so forth. As someone who had been coding since the age of twelve or thirteen, it wasn’t a lack of skills or experience which caused this reaction, rather the prospect of doing so in a wildly different environment to that which I was used to. In academia, code is rarely reviewed. There isn’t an audience, it’s just an aspect of the job you complete. In industry it’s much more purpose-driven. There are goals and deadlines and milestones. Your work must deliver value for customers. In the end everything was fine, and that code I wrote still exists in the platform to this day, but it shed some light on how sheltered we are in academia from the realities and stresses of industry. By spending time in industry I learned how to adapt to a different type of coding environment, and am a more well-rounded professional as a result. By exposing these younger people to industry in the earliest parts of their careers, rather than far later on as I did, the next wave of computer scientists will be equipped with not only the curiosity of the academic, but the practicality and work ethic of industry. This, I hope, will spur the next great developments in AI. I recently had the rare opportunity to have a long, honest conversation about the outsourcing industry with a client of my firm, but not one of my direct clients. We were seated next to each other on a flight, and being trapped in a metal tube at 35,000 feet allowed us to trade opinions and experiences in a way no agenda-driven meeting ever could. I was enlightened. The client, a deeply experienced applications executive, was in the process of moving his entire application portfolio from a legacy, multibillion-dollar-in-revenue IT services provider to a much smaller provider. And he was thrilled with the new level of service, dedication and quality he was receiving. It had not occurred to me until that moment that this is not an isolated incident. His rave reviews were for a particular provider, but this same phenomenon is happening everywhere. Small providers like Tech Mahindra, Syntel, L&T Infotech, NTT Data, Softtek, Mindtree, Globant and many others are not only competing vigorously for outsourcing business in the Global 20 00, they are winning it! Competition is good for the industry and good for customers. A bigger pool of qualified contestants raises everyone’s game. 1. Customer intimacy, dedication and superior service. Smaller providers have used the big-fish-in-a-small-pond argument for decades, but now the benefits are actually making themselves known. It’s rumored that some clients have been taken for granted by their super-large providers, but I think another subtle novelty is at play here. Now that buy-side enterprises have more mature management practices, they can work more successfully with less mature organizations. And these organizations make up for any potential lack of capabilities with hunger, humility and passionate dedication. 2. Near-shore effectiveness. As technology teams are asked to work better, faster and cheaper with agile methodologies, being in the same time zone helps. Having the same socio-cultural references is invaluable for the design and execution of anything that touches the human experience, such as graphical user interfaces, websites and mobile and social applications. Of course, not all small providers are near-shore, but those that are can stake a claim to some high-growth niches that suit them just fine. Those that aren’t are still finding niches to dominate, such as next-generation enterprise resource planning systems and complex, industry-specific applications that never used to get outsourced. It turns out “digital” is big enough for all of us. 3. A leveled playing field. Much like the cloud leveled the playing field for infrastructure services (nobody has an advantage when everything is new), digital has done so for the rest of the industry. It’s much easier to work with a new provider when nobody can claim years of experience, especially if that provider shows a greater willingness to take risks and support your business outcomes. 4. Big companies want what little companies have. If you are used to serving the middle market, then you are used to working with more agility and you are more likely to work on programs that contribute to revenue growth. There just aren’t enough dollars to fund back-office stuff that has little impact on the top line. Small providers have been working successfully with smaller clients for years, and now the big buyers want in on that action. Remember, today’s startups are “born digital,” and they will be the dominant, large companies in just a generation from now. There are more, equally powerful reasons to consider small providers, but the most powerful one may have been articulated by the executive on that airplane: “I can’t imagine ever going back. They are easy to deal with, they fix their mistakes fast, they know what they are talking about, I sleep well at night, and I’m having fun at work for the first time in years.” What’s not to love? Why have so many sourcing advisors failed with automation? 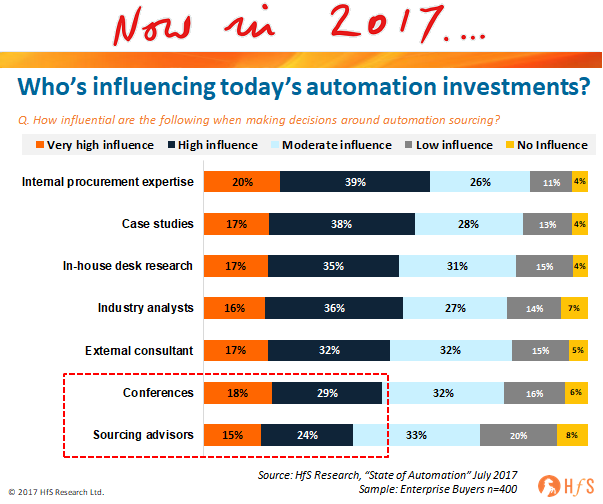 Less than half the RPA buyers view either consultants of sourcing advisors as influential in their automation sourcing. Even conferences are impacting automation buyers more. So what’s gone so wrong with advisors in automation? Credibility. Suddenly many advisors who were previously hawking their deep understanding of HCL versus TCS’s FTE rate cards are now suddenly adding their names to white papers on automation and trying to insert themselves into serious client conversations about said topic. It’s just not credible. Smarter clients. The swirl of information over social channels is so intense these days that most clients’ knowledge isn’t that far behind the experts. In many cases, you’ll learn more about RPA talking with a client in beta mode than an advisor or analyst trying to impress you at a conference. 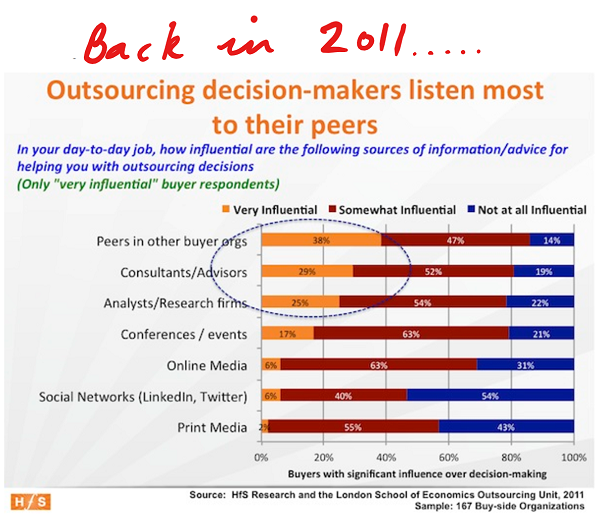 That is why internal channels, such as procurement and plain old desk research is such an influence factor these days. Archaic focus on headcount reduction. Just because you could create simple cases for headcount reduction with “take the people” outsourcing, doesn’t mean you can deploy the same draconian strategy to automation. Even the most clueless governance executive knows you can just fire people before you programmed some manual activities into a piece of software. Sure, there are serious productivity gain to be gleaned over time through the digitization of manual processes, but to tie this to immediate headcount takeout just doesn’t work. Competition from service providers. For the first time, sourcing advisors and service providers are going head to head, and automation is the promoter of the fight. When clients want to understand RPA and a partner so help them roll it out, they need people who are in the game for the long haul, not a broker to dip in and out and get a deal done. Many of the sourcing advisors are just not transformation people – they are great at helping clients plan their outsourcing weddings, but marriage guidance councilors they truly are not. Service providers depend on long-term, complex and often messy relationships to keep them employed and busy… and RPA really fits the bill. While it poses significant threats to their margins over the long term, they cannot afford to be not playing in the automation game. What’s more, most the BPO service providers are rapidly running RPA in their own delivery organizations, which is giving them the experience and lower cost base to be effective. The traditional consulting model doesn’t work with RPA. The advisors are struggling to scale up talent bases that can understand the technology and deal with the considerable change management tensions within their clients. RPA is murky and complex, and not something you can train bus loads of 28-year-old MBAs to master overnight. Meanwhile, we are seeing some advisors simply do some brokering of RPA software deals for small fees, only to make a hasty exit from the client as they do not have the expertise to roll-out effective implementation and change management programs. RPA specialist consultants few and far between. Pure-play RPA advisors are explaining this is not quite so easy and requires a lot more of a centralized, concise strategy. There are simply not enough of these firms in the market, especially with Genfour having been snapped up recently by Accenture. With only a small handful of boutique specialists to go around, these firms can pick and choose their clients and command high rates. Quality RPA advisory boutiques, such as Symphony Ventures, are literally turning business away as they cannot scale fast enough to cope with the demand. Advisors are not producing research. There’s a reason why procurement folks, analysts and simple desk work actually sit above advisors in the new data – clients want product specific benchmarks and real experienced advice that they are simply not getting from the advisors. All the advisors are putting out is the same of tired “drama” about robots replacing workers, and how to think “strategically” about RPA. While I like some of the stuff I see coming out of the likes of McKinsey, KPMG and EY, it’s just not giving me the real deal about which RPA vendor I need to be working with, how these tools truly stack up against each other and how I can actually build a bloody bot. That is why many clients are getting more reality from attending a conference than the lovely lunch they just got bought from their nice friendly consulting partner. Turgid, hackneyed marketing doesn’t work anymore. Cheesy pictures of robots and the same endless stream of 300-foot view puff that sounds just like the last piece you read on LinkedIn by some weird dude who you can’t actually recall allowing into your network, isn’t helping matters. These advisors are relying on their brand and past reputation for credibility in a world where clients want to see some meat on the bones. This industry has literally entered into a destructive war over automation, and the need for credible, independent and experienced advice has never been so in demand from customers. The skills to make automation a feasible profitable reality are few and far between, while greedy corporate leaders demand cost savings that simply are not achievable if their organizations fail to make the necessary investments and partnerships. Did companies become world class at HR overnight because they bought an expensive Workday subscription? Or stellar at sales and marketing because they slammed in a Salesforce suite? So why should they become amazing at cost-driven automation simply because they went and bought some licenses from an RPA vendor promising bot farms and virtual labor forces? RPA and Intelligent Automation have sparked a major war in the worlds of outsourcing and operations, where many battles are being fought – and the winners will be those who are in this for the long haul, who can absorb some short-term pain in order to benefit from the larger spoils further down the road. While automation is killing outsourcing today – costing many people their jobs, their reputations and destroying the profitability of legacy engagements, those who can hunker down, focus on self-contained projects where they can fix one broken process at a time, can get stakeholders onside by demonstrating meaningful, impactful outcomes without major resource investments, will be the winners. Source: hfs-Why have so many sourcing advisors failed with automation? 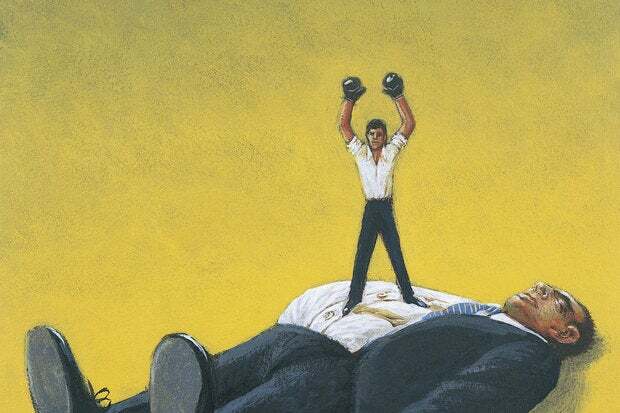 Many years ago, I had a client—a tough, salty engineer—who had risen to become Chief Operating Officer (COO) of a global Fortune 100 enterprise. He was widely feared by just about everyone. My first meeting with him was rough, and the CIO smiled when I briefed him on my session. He said most meetings with the COO went this way. So, for my next meeting, I came armed with charts and with the data that backed up the charts in my briefcase. The meeting went well, and my firm stayed engaged on that transformation project for almost two years. Lesson learned. My last post, about the gains smaller providers are making in the marketplace, was easily the most popular since I started contributing to CIO.com. It made me a lot of new friends on LinkedIn. Yet I repeated my mistake: I came with anecdotes and no data, which is a particularly unforgivable error, since my company collects and reports on this data every single quarter. As you can see, the numbers support the hypothesis I laid out in my previous post. We track awards worth $5 million or more, and we track them by provider size. The smallest tier includes companies with less than $2 billion in annual revenue. The next tier includes companies with between $2 and $10 billion in annual revenue. And the third tier includes everyone else. 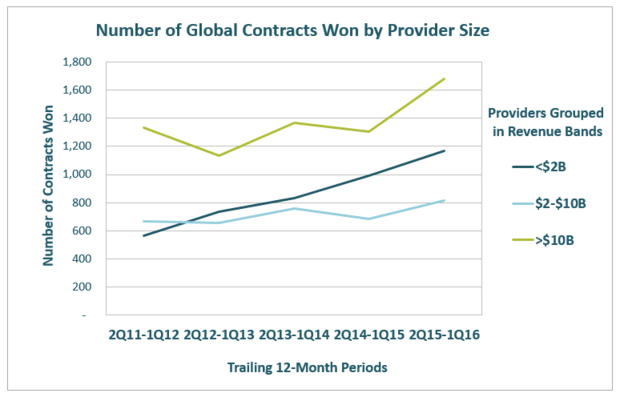 Our most recent findings show the share of deals won by the smallest providers has risen by 10 percentage points over the past five years, and this segment’s upward trajectory has been sustained and even accelerated a bit in the last two years. Perhaps most telling, as a group, providers with revenues of less than $2 billion won almost 400 more deals last year than their competitors in the group just one tier up. While this is great news for smaller providers, the data do not tell the whole story. Over this same period of time, the average deal value has gotten smaller while the cost of sales has remained constant, so these service providers are working VERY hard for their wins. But we all know that, once inside a large company, providers find it much easier to expand, so we should expect that, even with lower total contract values, it is only a matter of time before some of these small players begin to graduate to the next-highest revenue band. Even with these caveats, I’m sure you’ll agree the achievement of these Davids in a hypercompetitive field of Goliaths is remarkable.